HGG is an independent volunteer nature conservation group run by its members, with support from Horsham District Council. 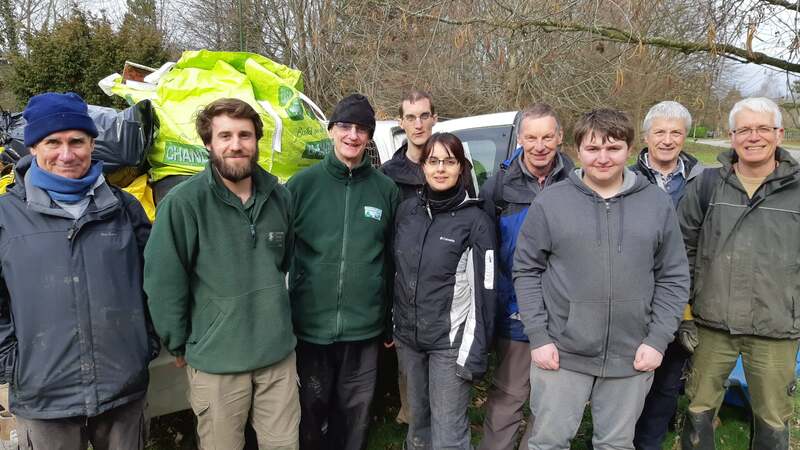 We work at various sites in and near Horsham, West Sussex getting exercise and fresh air while improving the local environment, learning new skills and making new friends. Membership is free. Our programme of work is planned every three months for the next three months. Sometimes, due to weather or other factors, sites and tasks have to be changed at short notice and it pays to view the website before leaving home. We meet at 10 am every Tuesday and Thursday through the year. The Tuesday group regularly has more than 30 people; about 20 members come to the Thursday meetings. You can attend on either day or both, as your other interests and commitments permit. We usually aim to finish work by 1.0 pm. Please have a good look at the ‘How to join us‘ page. Tasks have included installing simple benches, tree planting, clearing streams, bird box making, rhododendron, gorse and bramble clearance, path creating, path resurfacing and creating glades in the woods to allow wild flowers to re-establish. We are also proficient at creating dead hedges and removing plastic tree guards. Our members also have experience of pond clearance, fencing, coppicing and hedge laying. If all this sounds like something you would like to do, please have a good look at the ‘How to join us’ page. Are you involved with the care of a community site? If it’s in the Horsham area we may be able to help with clearance tasks. A group of keen volunteers can achieve a lot in a morning – and save you money. Please get in touch via the Contact details.